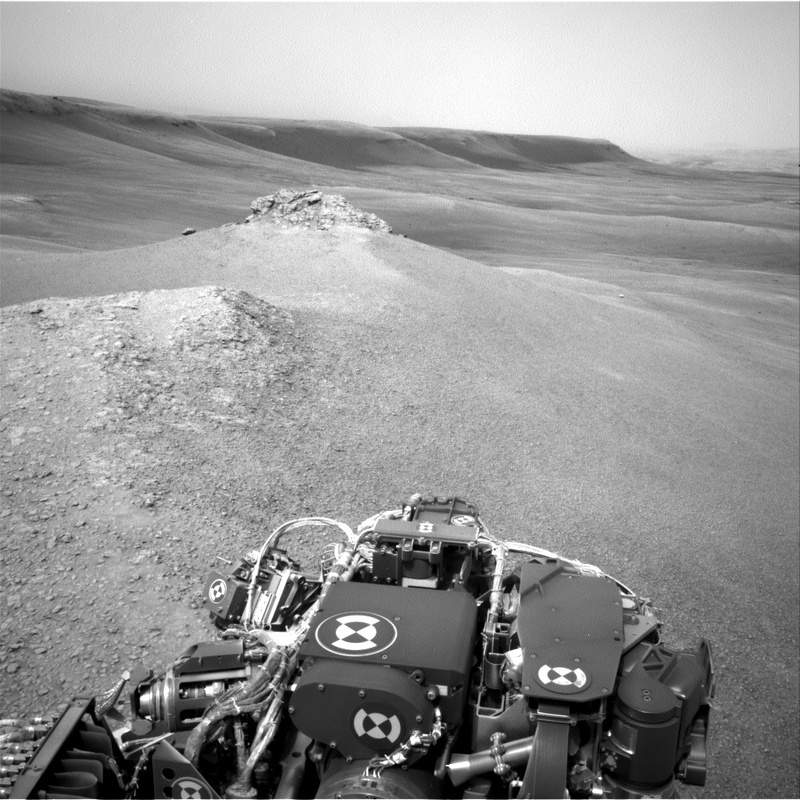 Curiosity successfully completed her drive yesterday and is currently parked on top of one of the ridges ("Knockfarril Hill") in the clay-bearing unit. One of the mysteries of the clay unit is the origin of these ridges - how did they form and what are they made of? This weekend's 3-sol plan is packed with observations designed to start addressing these questions. The current workspace in front of Curiosity is very rubbly, with no bedrock that is reachable by the rover arm. However, most of the clay-bearing unit is likely composed of this rubbly material, so it's important to characterize its composition and texture. To that end, we will acquire APXS measurements of this material on Sol 2308, using a rastering technique where the APXS will be placed over three overlapping spots in the workspace. By obtaining chemical measurements over different, but slightly overlapping areas, we will be able to distinguish the compositions of the pebbles from the sand and soil in the APXS field of view. We will also analyze the variety of pebbles in our workspace with ChemCam on "Brent" (also the APXS target), "Carluke," and "Foveran." In a happy coincidence, we had identified Carluke as a ChemCam target before we learned that the previous plan's ChemCam AEGIS observation had autonomously selected the same Carluke pebble to analyze! We decided to keep the Carluke observation in any case, to gather better statistics on the chemical variability in this pebble. We also planned plenty of Mastcam imagery given our relatively high vantage point atop this ridge. Two mosaics are planned to document the bedrock outcrop exposed at Knockfarril Hill and of a layered bedrock outcrop nearby. We will also document some intriguing aeolian ridges in the distance, as well as some enigmatic dark and bright aeolian features in an area called "Crawton." After all of these activities, we will make a short drive descending Knockfarril Hill on Sol 2309, while performing the second part of mobility tests to assess how to best drive in this new rubbly terrain. We close out our plan with a suite of atmospheric observations on Sol 2310, including Mastcam taus and dust devil surveys. I kept quite busy as the Geology Keeper of the Plan today, but it was well worth it to plan all of these exciting observations!